Hitting the street after Darius and Rose's cool jazz benefit at the Jambalaya last Friday, I came across a ragamuffin stringband called Treefingers busking in the alcove in front of Garden Gate. They'd come up from Temecula, a not-so-little town halfway between L.A. and San Diego for a show this Friday, June 26, at the Arcata Theatre Lounge. Since they were a week early, they figured they’d see if they could raise some travel money on the street, and once they'd opened a violin case the fives and ones started piling up. The music was an undefined sort of alt. grass: a pair of guitars trading licks with banjo and fiddle, a stand-up bass keeping the beat. I didn't recognize the songs as covers, so I'm guessing they were mostly originals. Their sound was not exactly new, drawing from various strains of rootsy stringband music — Django-esque guitar picking, a touch of bluegrass from the banjo and fiddle — one guitarist pulled out a harmonica rack adding another dimension. The main thing that struck me was the energy — you could tell they were having a grand time playing. Before I'd left they'd been offered a gig playing at the Jam during Oyster Fest, but when I talked to them Saturday they'd decided they could make more money busking outside. That's what they did, with a friend joining in on musical saw. I imagine playing on the big stage of the Arcata with microphones and all will be a bit different, but I'd wager the high-level energy will be the same. Joining them at the ATL is Medicine Ball, a "village music" band with Ishan on banjo, clarinet etc. and Willoughby on a makeshift drum set pulled together from pots and pans, shakers "and things that go buzz." Ishan's baby boy Eero is also an official member, but, says Willoughby, "he tends to get kind of distracted." Expect guests, mostly unannounced aside from Mahdi, who will supply vocals at some point. Otherwise expect the unexpected. Izabella is back in town Friday laying down funky rock 'n' soul jams from their new disc, Drugs and Apple Pie, at the Red Fox alongside Humboldt's own Moo-Got-2. Saturday Izabella plays Librarypalooza '09 in Covelo (a library benefit), then it's on to the stellar High Sierra Music Festival in Quincy 4th-o-July weekend. Slide guitarist Hurricane Henry Lord and trash drum-kit banger Johnny Buckets, a duo better known as Hillstomp, hit Humboldt Brews Friday with another shot of junkbox blues. They're this week's Portland Band of the Week. Arcata jugband The No Good Redwood Ramblers open. Around the corner at the Jambalaya Ryan Bisio, a former local, is up from the Bay Area doing the Americana singer/songwriter thing drawing on his new album, Rose Side of the Thorn. His manager, Virgil Bouler (who worked for the Journal long ago) notes that "many of the folks who have heard Ryan's name remember him from his days as an all-county basketball player who went on to play college basketball on scholarship." I saw the smoke from my back porch when the Humboldt Domestic Violence Service’s safe house burned last year. A “Rising from the Ashes” benefit followed soon after and the shelter indeed rose again. Now HDVS faces a different problem: a slashing of state funding. Saturday's Rising II: Keep the Phoenix Soaring at the Eureka Vet's Hall will help. Numerous local restaurants, brewers and wineries are kicking down food and drink donations. Blues, soul, jazz, etc. will be provided by Karen Dumont, Spanky McFarlane, Boomsauii, Bob Ebenstein, Michelle White, Julie Froblom and The Anna Hamilton Trio among others. I've never heard the Six Rivers Choral Artists, but I've heard good things about them. They note poetically on their website, "The Six Rivers Choral Artists' name embraces, celebrates and honors the singers who have flowed together like streams from near and far into a single powerful river, a river that flows on the breath of a unique and beautiful music." The very large group (70 plus members) gathers every June for a concert featuring, you guessed it, choral music, modern and classical. This year's show, Friday at the Arkley Center, also serves as a CD release party: They're rolling out Eight Days in June, a collection of live performances from past years. Back in my high school days, Blue Cheer's psychedelic blues cover of the old Eddie Cochran song "Summertime Blues" was part of my summer soundtrack. The music of Radio Moscow takes me back to those wild days. Wailing guitarist Parker Griggs formed the trio in 2003 in Story City, Iowa. (Isn't there also a Moscow in Iowa?) He plays guitar and drums on the band's records, but brings along a drummer on tour. Fresh from two months playing in Europe, the band is here for a brief residency including shows Friday at Aunty Mo's with like-minded psyche-rockers White Manna, and Monday, June 29, at the Jambalaya with DJ Paul Maul from HFRC spinning blues, garage and psyche tracks beforehand. The Missing Link boys having been talking about an instore, but considering the fact that the cops were called to shut down the relatively gentle Papa Houli and the Fleas when I had my photo show opening, who knows what the neighbors will think when they hear the roar of heavy, heavy blues. 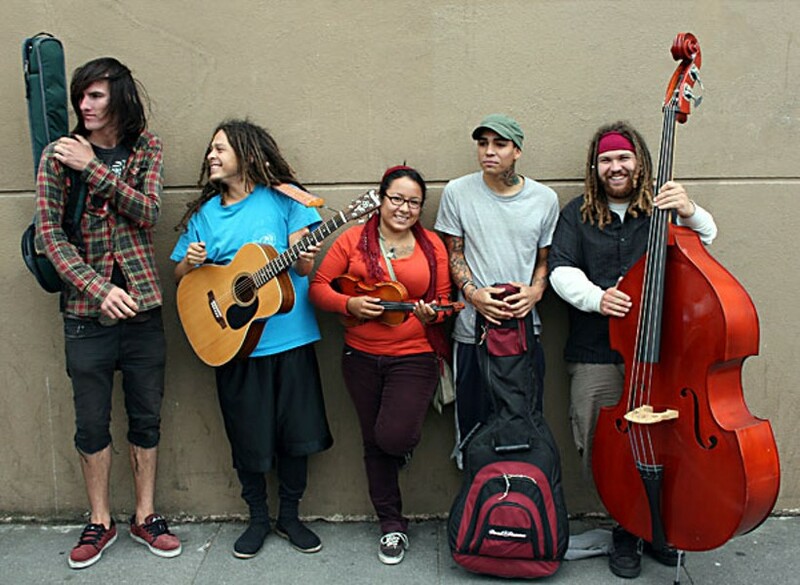 Blind Bellingham-based politi-folk-punk Boris Budd and his cohorts The Waterboarders bring it to the Boiler Room Thursday, June 25. Boris' songs deal with topics Humboldters may relate to: "Medical Marijuana" is about just that (with a reggae beat). He also has a paean to the Bellingham Roller Betties, a women's roller-derby team. Coming to the Boiler Room Tuesday, June 30, is Mobile Deathcamp, a Midwestern death metal band that includes bassist Todd Evans whose claim-to-fame is a stint as Beefcake the Mighty in Gwar. Their Jägermeister-sponsored tour also includes the Jäger Girls (not a band). Please note, according to Wikipedia, "Contrary to an urban legend, Jägermeister does not contain any deer or elk blood." The Kate Wolf Memorial Music Festival runs Friday through Sunday at Black Oak Ranch about 40 miles south of the Humboldt County line. You'll find the best in folk and roots music including sets by Emmylou Harris, Richard Thompson, Patty Griffin, Dave Alvin and the Guilty Women, Mavis Staples, The Blind Boys of Alabama, Preservation Hall Jazz Band, Rosalie Sorrels and Ramblin' Jack Elliott. The rambling cowboy from Brooklyn figures he's played the fest seven or eight times, often singing with his "old friend Rosalie." "We never work anything out in advance; we just let the magic take its course," notes Jack. "I just get onstage and hope that my guitar's in tune. That's about all the preparation I do." He says he always has fun at the festival. "It's a great adventure, getting together with old friends from the music world in a country situation that's very relaxed and friendly, playing outdoors." Jack is actually playing all three days, although aside from Rosalie, he wasn't sure with whom. "I've probably met them before but I can't remember what their names are. I figure when I get there, they'll tell me what to do." Organizers filled in the blanks: He'll play Friday with Rosalie, Sunday he tells stories and plays solo and, "He will be joining Chris Smither and Dave Alvin for a set over at one of our more intimate stages late Saturday afternoon." That's the way things work at Kate Wolf. We're told to watch for "impromptu drop-ins" by Shawn Colvin, Patty Griffin, Buddy Miller, Joe Craven and "an unannounced guest or two." "I'm looking forward to having a good time at the festival, meeting everybody," says Jack. "You know Emmylou Harris is going to be there. There's a lot of good music. I know we'll all have a fine time." That much is for sure.